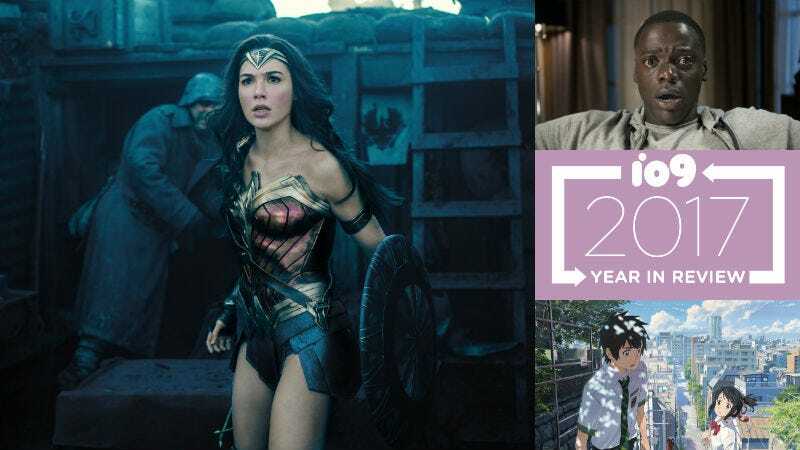 As 2017 comes to an end, io9 starts to look back at the year that was. In film, at least, the year was excellent. So excellent, in fact, that figuring out the top 10 scifi, superhero, and fantasy films was incredibly difficult. However, while there are at least 25-30 movies from 2017 deserve at least some recognition, ultimately, the cream rises to the top. Here are the 10 best, followed by five worst, genre films of 2017. Your Name is the best film of 2017 for so many reasons. This mega-popular Japanese anime is the story of two high school students who randomly start swapping bodies in their sleep. As each goes in and out of their own life, as well as the other’s life, a mystery unfolds that is epic, beautiful, emotional, and tremendously exciting. It’s everything we go to the movies for and so much more than that. Frankly, we’re getting choked up just thinking about it. If you’ve neither seen it nor heard of it, you should change that immediately. Big-budget blockbusters aren’t supposed to make us feel so much. They’re supposed to entertain and wow us, sending us back out into the world with pep in our step. War for the Planet of the Apes is not your typical blockbuster. It has all the effects, action, and DNA of one of those movies, but it’s deep. It’s painful. The performances, even behind all that CGI, are dramatic and soul-searching. And by the end, Apes just weighs on you with its impactful drama and stellar filmmaking. When news hit that one of the Key & Peele guys was directing a horror movie, it seemed like a joke straight out of the now-defunct sketch comedy series. But, except for some subversive dark humor, Jordan Peele’s directorial debut was a deadly serious exploration of interpersonal and institutional racism in America. After African American main character Chris (Daniel Kaluuya) realizes his body and cultural talents are being appraised during a creepy auction at his white girlfriend’s parents’ house, he then has to live with the terrible knowledge that living in 2017 doesn’t necessarily mean that he’s all that removed from slavery’s legacy in the United States. The best superhero movies usually share a lot in common, but Logan is something different. It’s introspective and more character-driven than the comic book movies that came before it, especially the X-Men films. It took a world and character we’d seen in eight other movies and, somehow, still managed to surprise us. Logan takes Wolverine (Hugh Jackman) to a logical, but nihilistic conclusion—he’s past his prime, his healing factor is failing, and he’s failed to save those he loved. All he can do is survive. That is, until a pint-sized female clone of his, named Laura (played with an amazing ferocity by Dafne Keen), arrives in his life. The captivating father-daughter relationship made us look at Wolverine in a whole new light—and reminded us how innovative and powerful superhero movies can be. This one is still relatively fresh in our minds, so we figured right here in the middle was a safe place to put it, in case our feelings about the film settle down a bit over time. Still, there’s no doubt The Last Jedi is one of the best genre films of the year. It shatters the expectations of what a Star Wars movie can be and it does so in ways that not only improve The Force Awakens, but also set a tone and high bar for the franchise as whole. It takes bold risks, makes crazy decisions, and has some of the most jaw-dropping visuals of the year. It’s unlike any Star Wars film we’ve ever seen before—and that’s a good thing. Wonder Woman is a bit of a miracle. Diana of Themyscira is one of the most notoriously difficult superheroes to pull off well, even in the comics. The fact that her movie gets the character so right, even as the DC movies have gotten Superman and Batman so wrong, is astonishing. Changing her origin from entering Man’s World during World War II to the bleaker, more futile World War I ended up being a genius move; it helped encapsulate Wonder Woman (Gal Gadot) as both a warrior and a protector, while the film’s excellent action scenes made sure everyone knew she’s a badass, too. Not only is it the DCEU’s best movie, it’s s one of the best superhero movies to date, period. Since the release of Pan’s Labyrinth, Guillermo del Toro has made several good movies, but none that were great—that is, until The Shape of Water. Combining the love of fantasy the director is known for with infinite heart and style, The Shape of Water is a dream-like, beautiful movie about a mute woman (Sally Hawkins) who falls in love with a mysterious amphibious man (Doug Jones) after he’s captured and brought into the facility where she works as a janitor. It’s incredibly smart and poetic, but also audacious and funny. The performances are marvelous and it leaves you feeling like you are floating on air. Thanks to director Taika Waititi, we knew Thor: Ragnarok would be funny. We didn’t know it would be one of the funniest movies of the year. In the third installment of the thunder god’s cinematic adventures, Hela, the goddess of death, arrives to destroy Thor’s world (and his hammer). The whole movie pulses like a nightclub, with kaleidoscopic visuals and dazzling action. No, it doesn’t have the emotional wallop of some other Marvel movies, but it has a literal wallop in the incredibly fun team-up between Thor and the Hulk. After the staid Ant-Man and Doctor Strange, Ragnarok was a vivid reminder that Marvel can still subvert expectations when it wants to. Raw is as gory as it is vibrant. It’s the story of a young vegetarian who goes to veterinary school and develops a taste for human flesh. This student-turned-cannibal must then navigate her criminal appetite along with school and a mysterious family history. The film is told with a kinetic filmmaking style that makes even the simplest moments resonant along with the brutal ones. And, as the film unfolds, things only get continue to get more and more, well, raw. A fascinating character study wrapped in an entertainingly horrific package, Raw is wonderful. Hollywood simply doesn’t make science fiction movies like Blade Runner 2049 anymore—movies that are epic in scope, with major stars, huge budgets, and slow-burn, intricate, weird stories. Blade Runner 2049 somehow not only met the expectations of a follow-up to its iconic predecessor, but it expanded and built on the mythology in surprising and satisfying ways. Harrison Ford’s Deckard was back, but only in service of Ryan Gosling’s K, a replicant cop who’s drawn into a high-stakes case. Plus, story aside, there was not a more beautiful piece of filmmaking all year. Every frame of Blade Runner 2049 is a work of art. Trying to describe the story, motivation, or basically anything in Transformers: The Last Knight is an exercise in futility. The movie is jam-packed with plot, little of which makes sense or links together logically. And yes, of course, this is a movie about aliens that transform into trucks, but that doesn’t mean it should be so long, boring, or nonsensical. And this was supposed to be the Transformers movie that restarted the franchise, not put a stake in its heart. More Transformers movie will come, but we doubt many will be as bad. Maybe before casting and announcing a massive, multi-film franchise, make sure the initial entry is good... if not great? Unfortunately for the Universal’s Dark Universe, The Mummy is neither of those things. It’s a generic action movie that feels tangential to the Universal Monsters property it’s based on, filled with links to a world moviegoers will most likely never see. Somehow it totally misunderstands what makes a good monster movie, and is still just an average action movie, too. A huge disappointment. If movies were judged on how many scenes they have featuring people looking at computers, Geostorm would have been a massive success. Instead, it’s the opposite, a flat take on a global disaster storyline with performances and drama that barely qualify as such. The effects are disappointing, the action lackluster. How a movie that features Gerard Butler saving the world from space could be so underwhelming is beyond us. The first Flatliners is basically an okay movie. So to remake it with better visual effects, but very few other innovations, was an odd choice. The premise—a group of doctors explore death by killing, then reviving, each other—still sounds great on paper. It’s just that in execution, Flatliners is less about exploring death and more about being a weak-sauce horror movie. The Dark Tower had a great cast, and it certainly didn’t lack ambition; since seven movies based on seven books in the Stephen King series was probably never going to happen, this single film tried a new approach to the material. Unfortunately, the approach taken undercuts much of what made the books so beloved, and completely fails to entertain in the process. It’s a flailing corpse of a movie that was DOA long before it made it to theaters.